Hey my friends, I'm back. Not that soon as I promised, though. I don't know what is keeping me from doing anything! May it be Christmas around the corner? May it be my laziness? Or both? I just know that I feel like I have less energy left inside of me these days. I want sunshine or snow. I guess, I simply just need more light. I know that sugar makes me happy and keeps my energy up! This theory was thoroughly tested during my studies. Oh yeah, I can not even say how much chocolate I ate during every exam term! :) I did not nourish myself with chocolate this time, though. 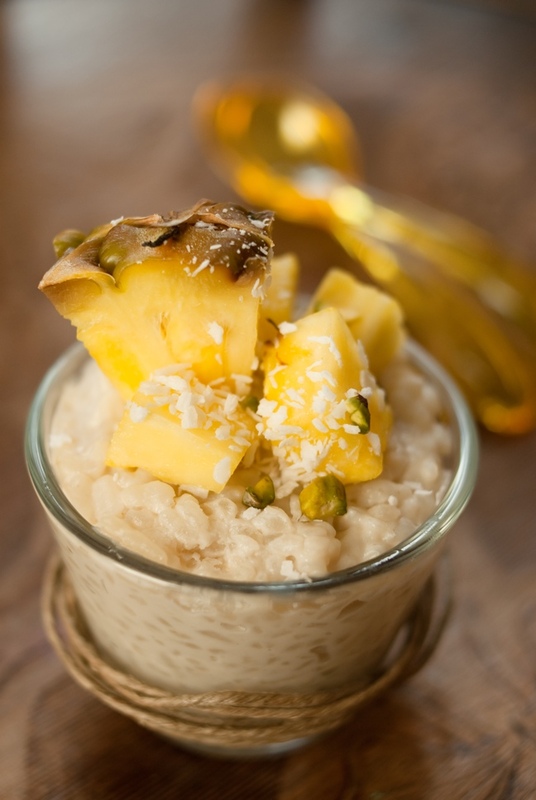 I know I have already posted a recipe for a rice pudding some time ago. However, rice pudding is one of my all time favourite desserts, and I made a lighter version, omitting a double cream, and I used a proper pudding rice. 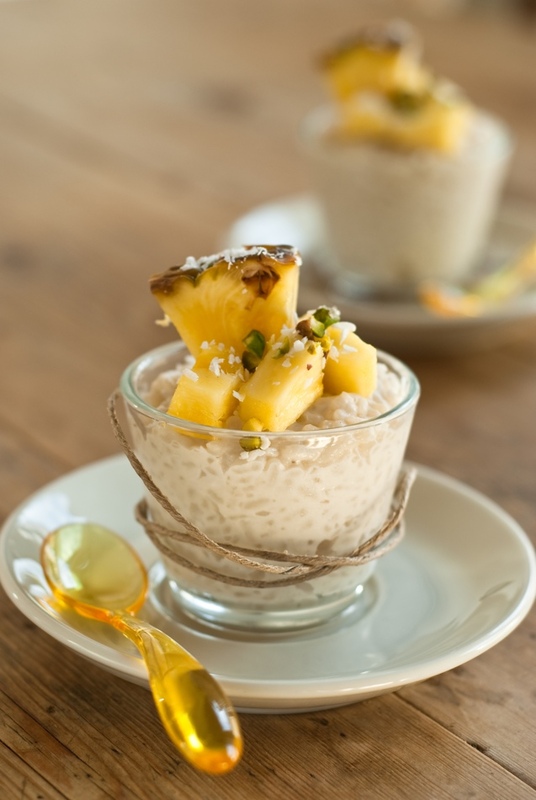 I used a pineapple to serve my rice pudding, but it is delicious with any fruit you find at home. I even like it just plain when the pudding is still warm. 1 Wash and drain the rice in a sieve. 2 Heat the coconut milk mixed with the full fat milk and cardamon pods in a small sauce pan over a low heat. Bring to the boil. 3 Add the rice and stir well. Simmer, covered for about 20 minutes, stirring occasionally, until almost all milk is absorbed and the rice is tender. 4 Discard the cardamon pods. Add the sugar and stir well. I usually let the rice stand, covered, for couple minutes before serving. 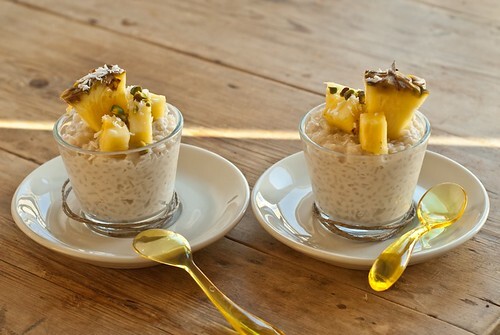 5 Divide the rice pudding between prepared bowls or glasses and top with pineapple, coconut and pistachios.